If you’ve sent a mailing or email to a group and want to document that to a batch on a mass basis? This is how! 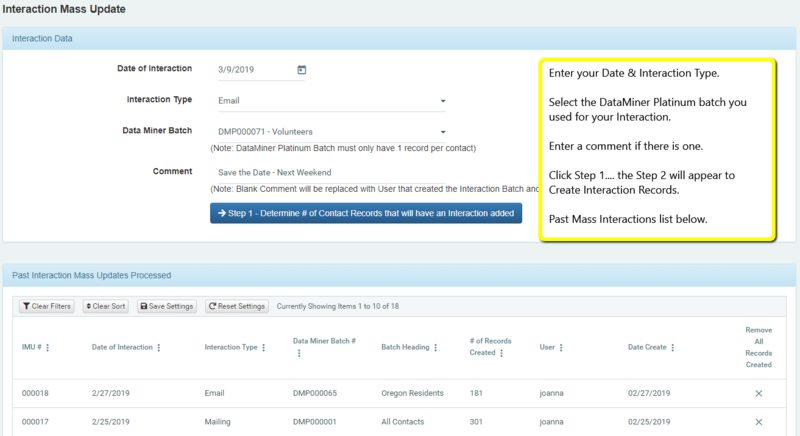 If you created your “Group” under DataMiner Platinum, within DonorSnap, you can mass update that group with your interaction of a mailing or email. Select the Interaction Type from your Dropdown list. Select the DataMiner batch that contains the Contacts you’d like to add this Interaction to. Click on the Step 1 button to see how many Interactions you are about to add to your DonorSnap database. Does the number look close to what you were expecting? If the number in the previous step appears correct, click on the “Create Interaction” button to add an Interaction record to all applicable Contacts in your DonorSnap database.